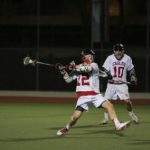 March 8, 2014 – The Biola University Eagles men’s lacrosse team needed late game heroics again to pull out the win over the Cal State San Marcos Cougars. After taking a four goal lead into the fourth quarter, Biola couldn’t keep San Marcos at bay, and they stormed back to tie the game late in the fourth. The Eagle’s managed two goals with under two minutes left to ensure the victory. Biola jumped out to a quick 6-2 lead after the first quarter, but San Marcos’ defense responded in the second with a second quarter shutout. The Cougars’ offense managed to generate two goals in the second to cut into Biola’s lead, and the teams took to halftime with Biola up 6-4. The Eagles’ offense came back in the third quarter, scoring five times to San Marcos’ three, and the Eagles were up by four goals going into the fourth quarter. A resilient San Marcos team fought back in fourth, outscoring Biola 5-1 through the first 10 minutes of the quarter, tying the game at 12. 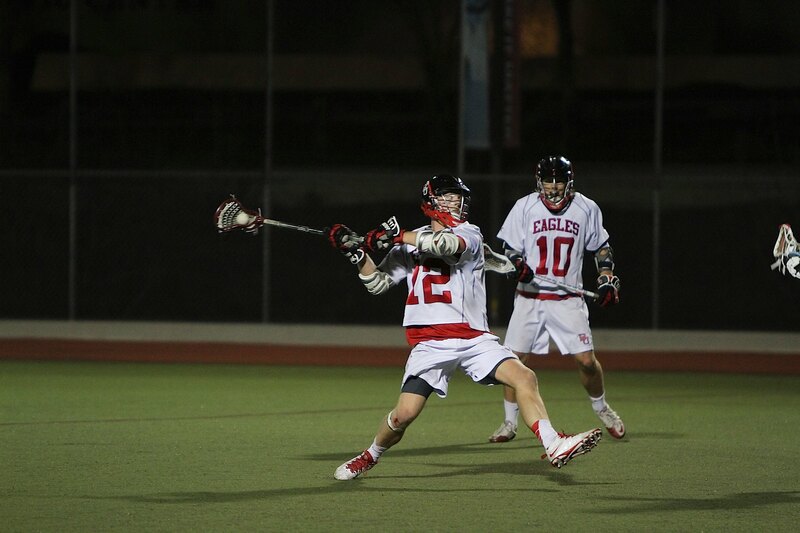 Bryce Hummel (Fr., Midfield) found himself free after a dodge from the midfield, and beat the goalie low to give Biola the 13-12 lead with under five minutes to play. Jon Prichard (Fr., Attack) added another goal with under a minute to play to give the Eagle’s a two-goal cushion, and the 14-12 win. Hummel lead the Eagle’s in scoring with four goals and one assist. Prichard and David Shaum (So., Attack) both chipped in with three goals a piece, with Shaum adding an assist to his totals. Josh Nordstrom (Jr., Midfield) tacked on two goals and one assist, Riley Corbett (Jr., Midfield) and J.T. Moranski (Sr., Midfield) both scored a goal, and Eric Gamelson (So., Attack) added an assist. John Harzan (Fr., Goalie) stopped 12 Cougars’ shots in the game.